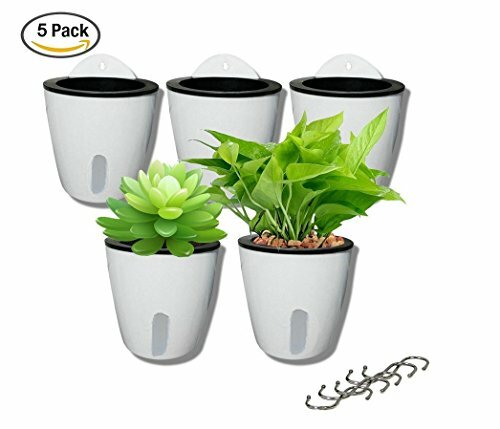 5 Pack Visible Water Level Lazy Flower pots Water Plants Pots Self Watering Planter Hanging Planters,Succulent Plants and Small Flower pots Indoor Out Flowerpot with 5 Metal Hooks (White) by DODXIAOBEUL at Tulips Orchids. MPN: 4336476645. Hurry! Limited time offer. Offer valid only while supplies last. Economic and durable,Can be used with various types of soil or hydroponic growing Media .Great for gifting. Perfect size for many locations. Economic and durable,Can be used with various types of soil or hydroponic growing Media .Great for gifting. Perfect size for many locations. Suction-cup flower pot with water system, solve the trouble of watering every day, automatic suction cotton rope can make plants self-sufficient in a long time, so as to avoid water plant death. Outer basin diameter 4.25",pots height 4.2",Inner pots diameter 3" , height 2.75"， Bottom diameter: 2.75 ".Each planter is approximately 4.25x4.2 inch diameter top opening, 3 inches high . Set: 5 hooks+5 outer basin + 5 inner pots + 5 root cotton rope.Indoor or outdoor plant window box. Perfect for herbs small flowers and succulents or Wall Hang Flower pot . Raised rim design allows easy handling and easy stack ability.Features: rugged, water-saving and drought-resistant,no easy to deformation, corrosion resistance, biodegradable . The back of the presentation of 90 degrees,Designed to hold a standard 3-6 inch potted plant, plants not included. Remove the internal pot, can hold office supplies, makeup pens, or artificial plants. If you have any questions about this product by DODXIAOBEUL, contact us by completing and submitting the form below. If you are looking for a specif part number, please include it with your message. H Potter Planter Rectangular Pot Flower Indoor Outdoor Window Box (Antique Copper) 12" x 4" x 4"